Following up on a recent Jay Jaffe post, I am examining the question of whether there is a World Series hangover. Unlike that post (which was great, but answered a slightly different question than I am interested in), I compared the full season performance of World Series winners and losers relative to their true talent level. I looked at all teams that went to the World Series in 2012-2016. I only went back to 2012 because that is far back as I could find projections in my less than thorough internet search. Finally, I omitted 2017 because they have played too few games this year for my purpose. As a proxy for true talent level I used projected wins from Clay Davenport. Why did I look at actual versus projected win totals? I did not find changes in absolute win totals informative in terms of the question I was asking. Teams change year-by-year. Changes in absolute win total could simply reflect talent level changes. By using projected wins as a baseline I hoped to control for, at least somewhat, changes in talent level. 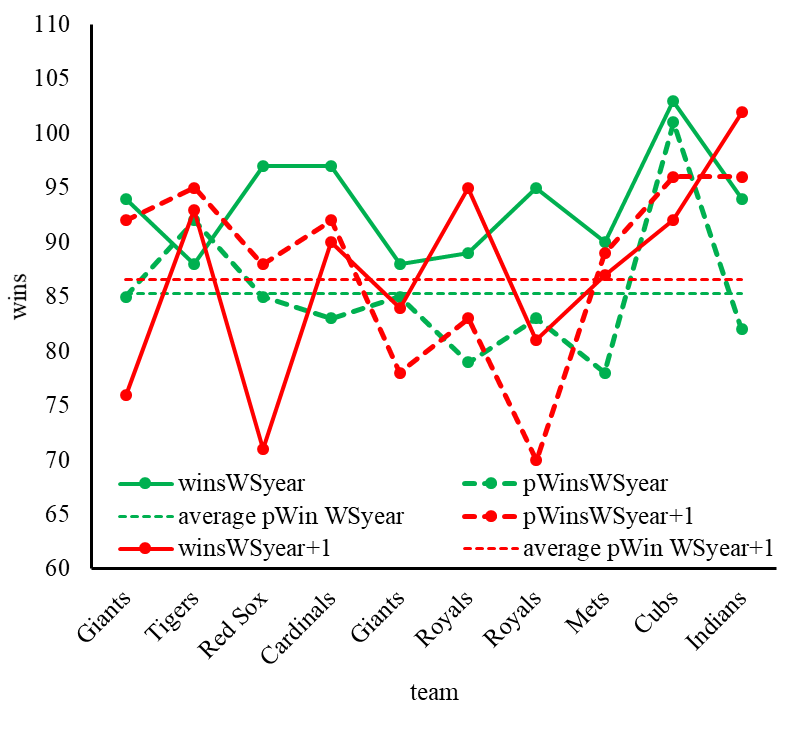 Using projected wins as a baseline also allowed me to examine whether any changes in performance across years was due to over/under performing in the World Series year versus over/under performing in the year after the World Series. Let us get to it. Below you will find the projected win total (pWins), the actual win total, and the average projected win total (average pWin) for the World Series teams in the year they went to the World Series (WSyear) and the year afterwards (WSyear+1). Busy figure, bear with me. My main point here is that the average projected win total is similar for the World Series year and the year after (a 1.3 win increase). The second point is to show the raw data as good practice. Next, I cared about how the teams performed compared to their projections in each year. That information can be found in the figure above, but better yet, here is a figure showing actual win total minus projected win total for the year the teams went to the World Series. This is interesting. 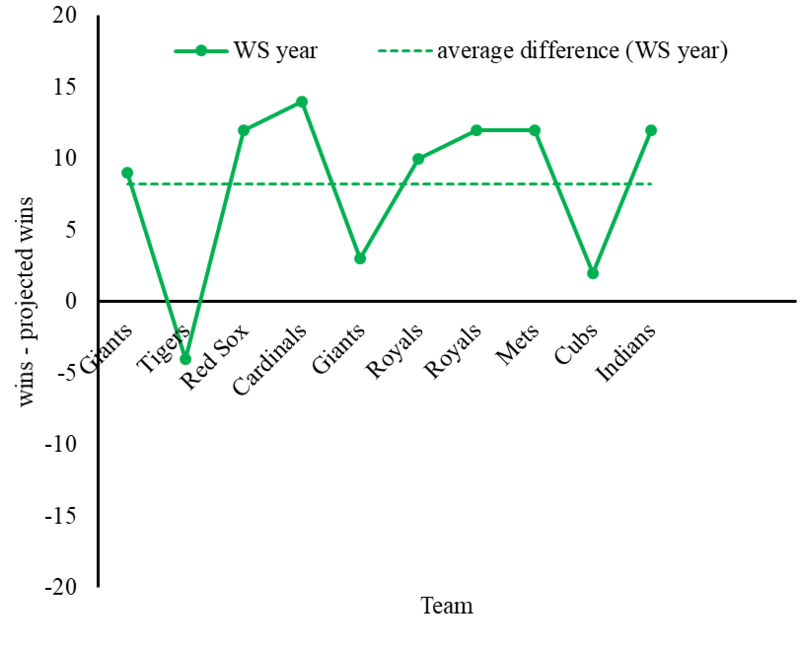 Teams that went to the World Series outperformed their projections by 8.2 games on average. With the exception of the 2012 Tigers all teams outperformed their projections (note that the 2017 Astros and Dodgers outperformed their projected win totals by six and seven games, respectively). The probability of 9/10 teams outperforming their projected win total is 0.010. Teams that go to the World Series outperform their talent level. What about in the year after the World Series? Below is the same figure as above with the year after the World Series added. Alright then. In their post World Series season teams have, on average, performed right at their true talent level (-0.8 wins). What have we learned? Obviously the sample is small and the data for the year after the World Series trip is quite noisy. That said, within this sample, teams were projected to win a similar number of games in their World Series year as the year after. They substantially outperformed their projections in the year they went to the World Series. They then came back to earth in the year after their World Series trip. 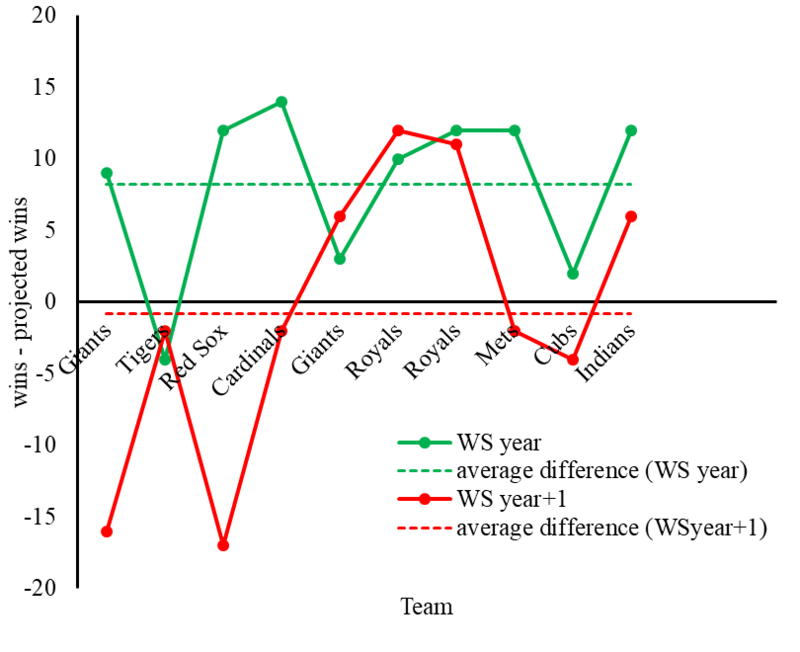 Keeping in mind my question was regarding a year-by-year change in a team’s performance relative to their true talent level, I conclude that there is a World Series hangover of a sort. Yet, its nature is quite different than one might think. Rather than teams underperforming after going to the World Series it appears that they over-performed in the year they went to the World Series. In other words, any World Series hangover may result from our powerful friend regression. We hoped you liked reading World Series Hangover: A Different Look by ForAllAndNone!